Each year I like to get a head start on projects for Christmas. The best time to start is right after Thanksgiving. Why dive into the crowds on Friday when you can just stay home and craft? 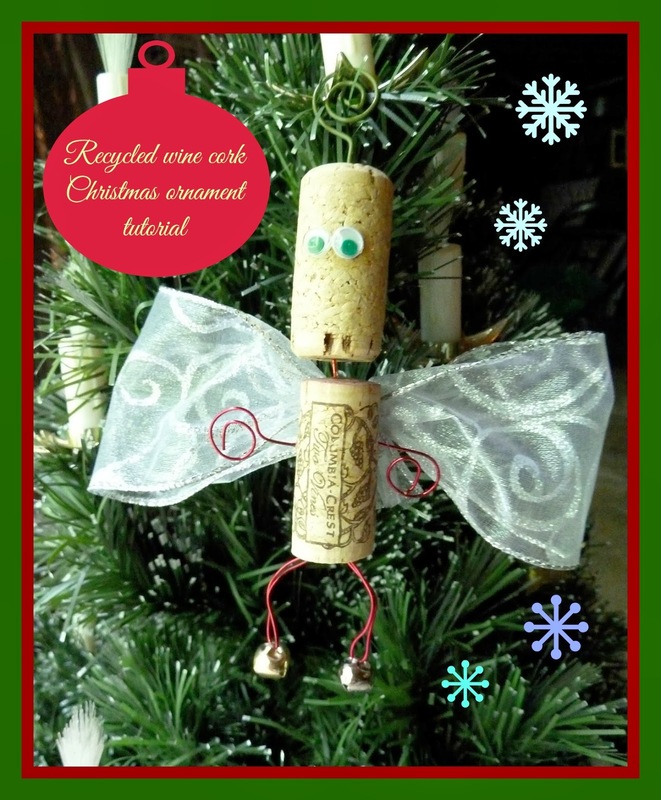 Make this recycled wine cork angel ornament quick and easy. When Christmas rolls around you can just sit back and enjoy the season. 1. Make a mark on the bottom center of a wine cork. Use the awl with a twisting motion to drill a hole about ½” into the cork. 5. Using the awl to drill two holes in the bottom of the body wine cork at the same depth as before. Cut two 4-inch pieces of 18-gauge wire. Thread a jingle bell onto the wire fold in half leaving the jingle bell centered. Add a dab of glue onto the wire ends and carefully insert into one of the holes you made. (Leg made) Bend the leg as desired. Repeat for the other leg. 6. Add two dots of tacky glue on the front of the head and attach two wiggle eyes. 7. Drill a hole into the top center of the head. Pull apart a round colored paper clip slightly; add a dab of glue and inset into the hole. You can hang your robot from this paper clip. He will dangle and jingle. 1. Cut an 18 inch piece of bow wire fold in half and insert long ways in the mini Bowdabra. You will have a loop on one side and two pieces of wire on the other. 2. Cut an 18” piece of white, sheer 2 ½” wide wired glitter ribbon. Insert leaving a tail to the edge of the ruler mark. Fold and make a loop the same on the opposite side. 3. Continue by making a matching loop on the other side and end leaving a small tail on the other side. Scrunch down with the bowdabra wand. 4. Insert the two end pieces of bow wire through the loop and pull tightly. Remove the bow from the Bowdabra and tie in a knot on the back. 5. Cut the end pieces short. Fluff up and arrange the bow. Use a glue gun and glue sticks to attach the bow to the back of the wine cork angel. Your angel is adorable. How cute. Thank you so much for sharing with Wednesday's Adorned From Above Link Party. Have a great week. I've been looking for some wine cork ideas. Thanks for linking up at Take it on Tuesday - hope to see you this week! !